SHORT: Fun day. Began in Hot Springs SD. Observed/photographed spectacular outflow-cloud structures (shelves, bands, stripes) with raging bow echo/haboob from BFF to N of SNY. 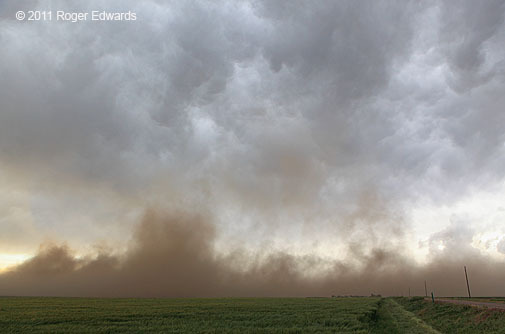 Dropped S for peculiar, photogenic dust storm and sustained damaging gusts beneath high-based N rim of eastern CO MCS. LONG: Back onto our storm-observing trek after a couple of amazing days in the Black Hills, flow aloft and at least marginal low-level moisture were beginning to juxtapose favorably once again to our south. 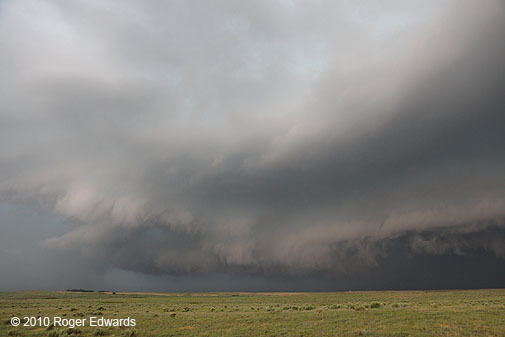 We targeted the nearby Nebraska Panhandle for the prospect of high-based storms rolling east out of the higher terrain of eastern Wyoming. Browsing the morning maps, I was confident in upslope flow into that orography, along with afternoon storm initiation…but would there be too much, too soon, before the richer moisture could arrive in the evening? This scenario would mean outflow dominance. Still, a conditional triple-point play in south-central KS was much too far away; and the mountains ain’t going anywhere. Blow increasingly moist air into them for enough time during daytime heating, and storms will form. Our goal: be downshear and see what evolves. High dew-point depressions portend shelf clouds, dust and high wind from storms; and sometimes that can be beautiful too. We drove to favorite overlook SW of Angora upon which we had perched a few days before, watching the top 4/5 of assorted towers build and glaciate over the unseen mountains of eastern WY. Finally, when the storms started to coalesce and move off, one of which looked like an embedded supercell on radar, we headed W to the N edge of BFF to watch them roll downhill right at us. 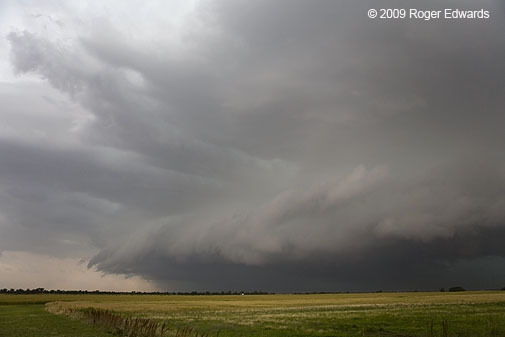 By then, the supercell was hard to distinguish in the onrushing wall of a dark, ominous, and increasingly well-defined squall line. Looking NW: I’ve never seen a combination of lightness, darkness and radiating cirriform streamers like this before! Looking W: Right into the teeth of Jaws. 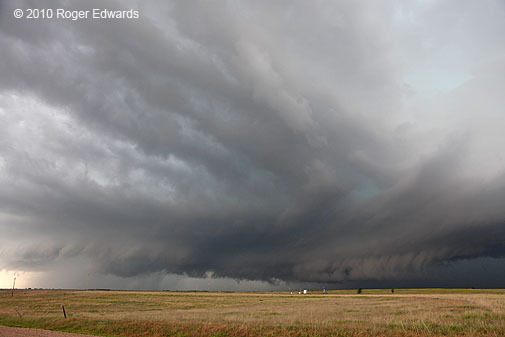 This is what a bonafide bow echo looks like when it’s “a-comin’ ta gitcha”. Check out the peculiar translucent strands, reminiscent of Silly String, festooning the otherwise featureless midlevel cloud deck. It might seem hard to photograph the strong dynamic range between the ink-dark core and the otherworldly apron of light above and beyond the shelf cloud; but not this time. This is how it actually looked, with no HDR bracketing necessary! I just had to meter for the area smack in the middle. Looking SW: A classic view of an onrushing convective windstorm on the High Plains, this time with the Wildcat Hills lining the southwestern horizon. We stayed ahead of the snapping maw of this storm — barely at time, I must admit — all the way to Bridgeport and beyond — before bailing S to let the road-deprived Sandhills have their turn at it. We got one last nice view of the atmospheric earth-mover raging to our NW before turning equatorward. 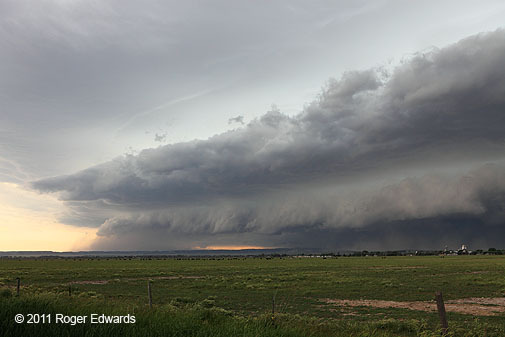 What a gorgeous display of outflow-driven stormscapes we had witnessed! Now it was time to get out of the way and figure out what to do with several more hours of daylight. Some storms had fired in NE CO, likely to be just as outflow-dominant and perhaps quite high-based. From SNY, it wasn’t that far away, and the next two days looked like potential Colorado storm targets anyway. As such, went back through Sterling again (retracing a good deal of our chase path from BFF three days before). After a late rainbow and dinner at a familiar restaurant in Yuma, we bunked down there for the night, satisfied that we made the most out of a very windy storm day. The human element of storm observing always has some interesting twists and turns too. We had a few loud neighbors at our motel, getting drunk and cussing in Spanish, and after a spell, I thought I might have to go out there and shut them up by request or otherwise. Fortunately for everybody, the former worked. The ringleader turned out to be cut from the cloth of my old barrio associates from long ago: he was wearing a shirt that said, in Spanish, “Don’t f___ with the DALLAS COWBOYS”. All day, I already had on my trusty blue-star cap. After some conversation about America’s Team, they retreated to their rooms, an elevated storm blew by with an intermittent show of close CGs, then off to bed everybody went. 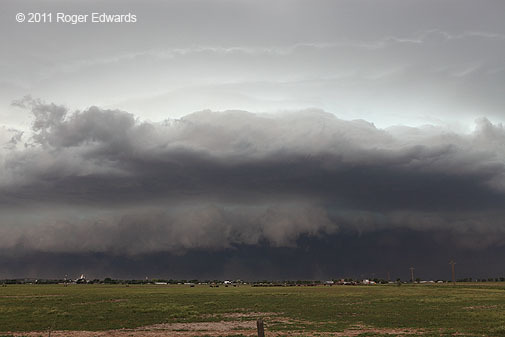 SHORT: Observed entire lifespan of supercell from SE of Dumas TX to near Coldwater KS including at least one tornado near Slapout OK. Also observed floods, beautiful clouds and bizarre cross-country cycling experience. 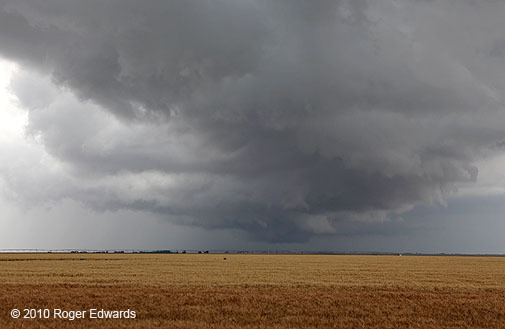 The strongest combination of moisture, instability, lift and shear was forecast along a segment of the former cold front (now gone quasistationary) from SW KS to the eastern TX Panhandle, dependent strongly on how far S storms could backbuild in a manner sufficiently discrete to permit cyclic mesocyclogenesis and greater potential for tornado development. The outflow-reinforced boundary lay from just S of Dumas to near Coldwater at 15Z, and wasn’t going to go far except where effectively shunted E by localized convective outflow pools. The 12Z AMA sounding had a very weak cap atop anomalously large dew points, with clearing skies, so early initiation (perhaps even before noon) was virtually certain. Riddle: What do Chuck, Keith, Texas Beef, and Natural Gas have in common? Answer: All are names of roads crossing TX-152 within 10 miles E of Dumas. 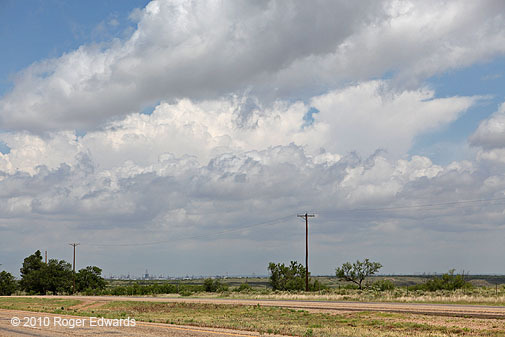 Heading E from Dumas toward the boundary, we saw towers already arising along it to our SSE by 1130 CDT (1630Z) — these would evolve into the eventual Perryton-Slapout area supercell. 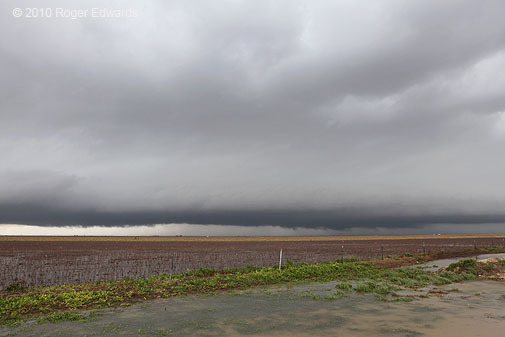 We got on the warm side of the boundary between Borger-Pampa, as the same towers deepened and glaciated to our NW. The chase was on, and it was only noon! The visit for fuel and burritos at a Pampa Allsups had to be succinct, so we could head N toward the projected storm target of Perryton. 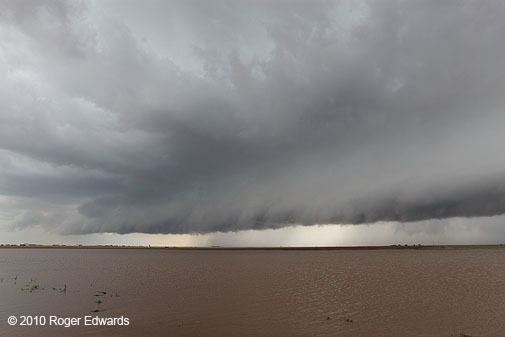 Once back up out of the Canadian Breaks and atop the Caprock again, we found flooded fields everywhere from the wet spring, led by the previous day’s egregiously profuse rains. 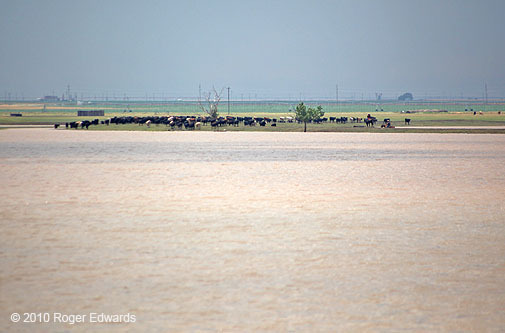 These cowboys S of Farnsworth had to herd their herd onto an island in what clearly wasn’t supposed to be a lake. Evapotranspiration was a given on this day! 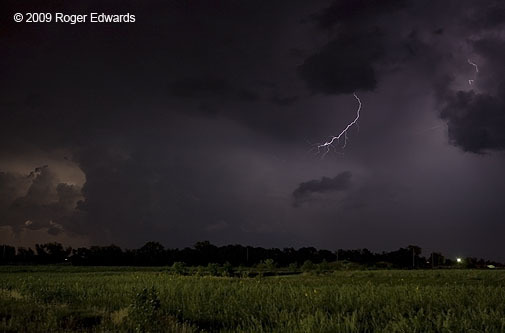 Every time I got out of the car — curiously, except near the tornado — mosquitoes descended in voracious plumes, bloodsucking varmints eager to draw sustenance from anything warm-blooded, and especially from storm observers. 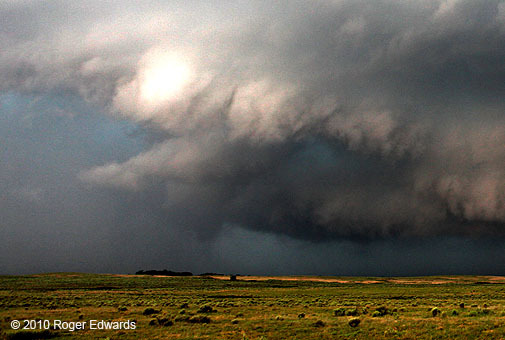 I wondered how many “skeeters” ended up advected into supercell updrafts and entombed in the cores of hailstones. 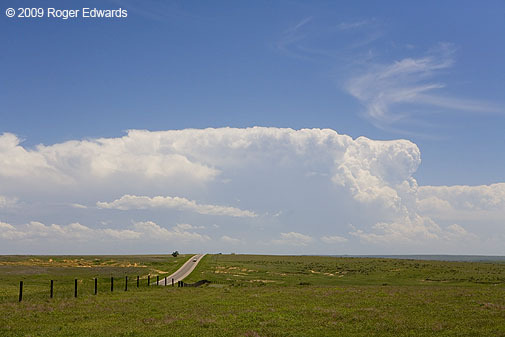 Our towers grew into a fuzzy supercell with a CAPE-starved appearance near Farnsworth, slightly behind the boundary. It probably was surace-based, but not in the best air mass at the time, but did exhibit occasional but not particularly strong cloud-base rotation from broad lowerings (looking NW). Meanwhile, strong cells were firing back down between Dumas-Pampa again, which we easily could intercept if this supercell fizzled. 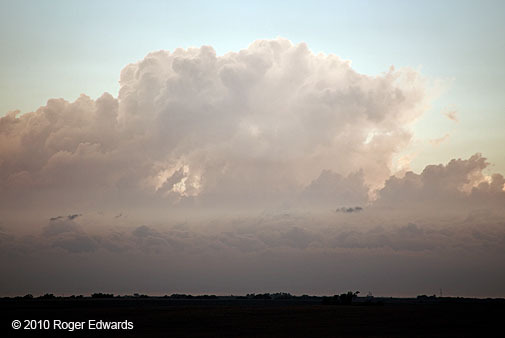 Instead, updrafts continued to develop in a break between our activity and the southern convection, merging in with the rear flank of the nearby storm. It all remained rather disorganized for about an hour, backbuilding at a rate nearly equivalent to its translation up the boundary, but with a slight eastward net component toward Perryton. We headed S of Perryton and down a submerged US-83 before the storm reached the area. Trucks in front demonstrated the shallowest path through the dead-still water, and that the road remained intact beneath; this is where driving a high-clearance 4×4 pickup came in handy. Such positioning would get us into position to intercept the southern storms if this activity couldn’t get better organized, or if it did, to head E and N to stay with the original convection, without dealing with the town and nearby flooding again. 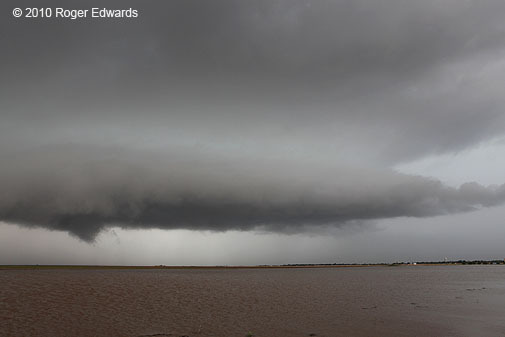 Our adjacent storm developed a large, sculpted shelf cloud, made even more scenic by the foreground of the huge flood S of town that I called Lake Perryton. 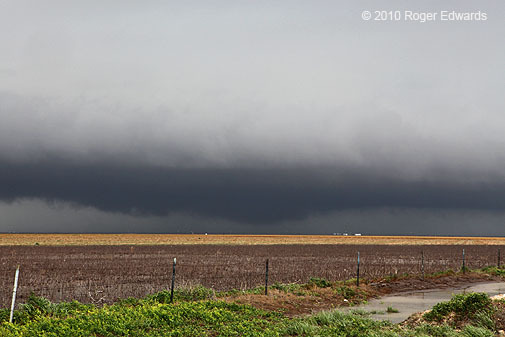 The south side of the storm sported a classic shelf, while the N side still wanted to be a supercell, with a tail cloud and occasional, weakly- to non-rotating lowerings. None of this, land or sky, looked much like the High Plains that it was! Most of all, this did not look like a storm that soon would produce tornadoes. 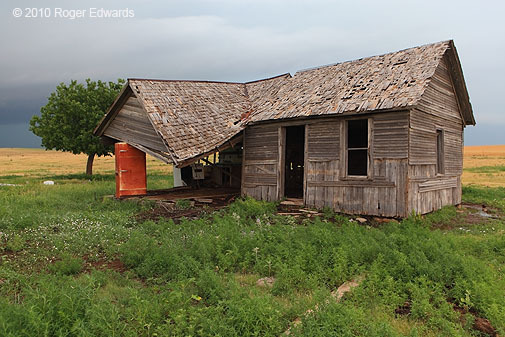 I was getting impatient with it, but instead of bailing S forthwith, I moved a few miles away and examined an abandoned house S of town with an eye back to the N, while stiff, cold outflow winds pressed down adjacent wheat. 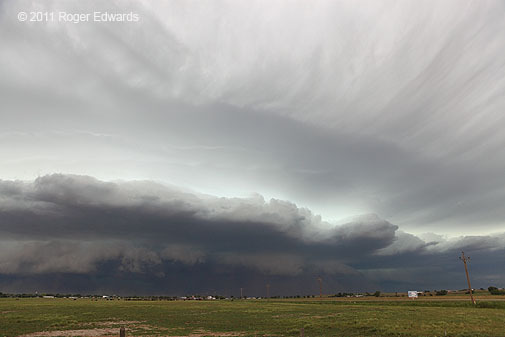 Good thing we didn’t give up on the storm, too, as it started to look better-organized and more like a supercell again (wide-angle looking N over Perryton). Its own outflow had carved out a swath of convection-free air upshear, while SE winds to its SE maintained good storm-relative inflow. Looking N from SW of Booker, a very well-defined clear slot and wall cloud appeared, and we knew we had to keep this storm in our sights. 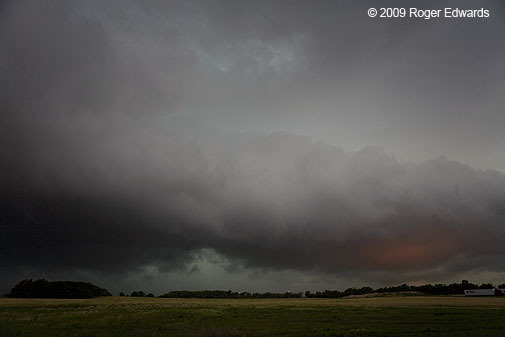 About 10 minutes after this shot, taken looking NW from just E of Booker, the mesocyclone region became rain-wrapped from our perspective, then immediately spawned the long-lived supercell’s first tornado, visible mostly to observers who buried themselves deep into the immediate mesocyclone area on muddy backroads. By then we were repositioning E, then N, to stay ahead of the storm. Recognizing this as an evolving, tornadic HP situation where one needs to get tucked into the notch NE of the mesocirculation to have the best shot at seeing a tube, we set up shop on US-412, in the OK Panhandle, between Elmwood and Slapout. That road provided a ready east escape, an option not available last time I was in a similar situation (with Rich T on 19 May). 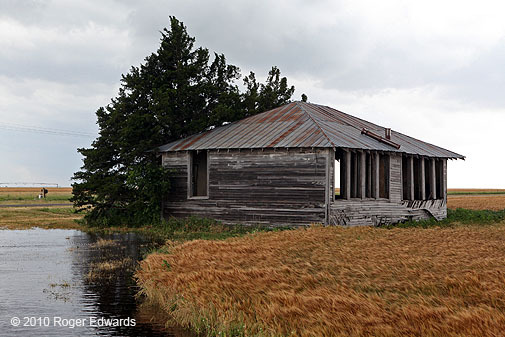 While watching the accelerating supercell approach, we spotted and photographed another abandoned house, this one strongly dependent on an antique, rusty refrigerator for its survival! When that porch overhang goes, the rest of the structure won’t take long to follow it down into the weeds. We moved uphill and N 1/2-mile, watching the storm approach. 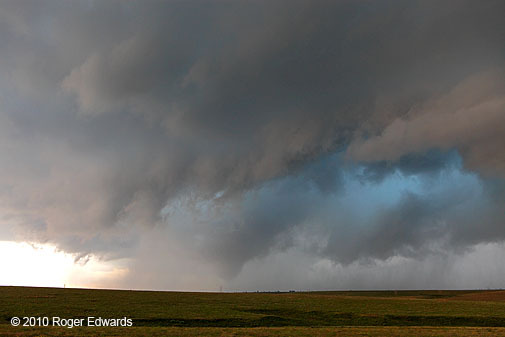 A partly rain-wrapped, rotating, bowl-shaped lowering appeared to our SW (wide-angle view at 1611 CDT/2111 Z, left side) that looked like it meant serious business. We needed to get back down to US-412 then uphill again to the E, in case that turned tornadic (it probably was already), and in case we had to make the great escape. On the way down, we spotted VOF Doswell roaming the grounds of the very same house, but didn’t have time to stop for idle chitchat. 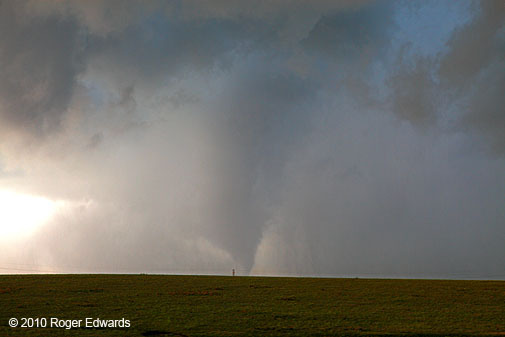 Just after we climbed E and parked beside 412, a brief funnel and some diffuse multivortex filaments appeared under the lowering at 1616 CDT, just before I could shoot. 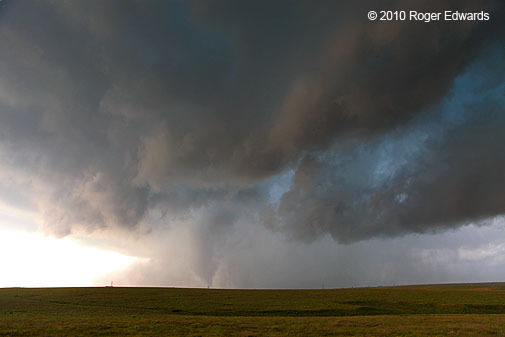 Although the interceding, non-condensational stage lasted a few minutes afterward, I believe this was one continuous, tornadic circulation with the next stage, which manifest as a bulbous, tapering cone, then a well-defined and rain-wrapped cone with filamentous elements whirling beneath. By 1620 CDT the visible tornado became elongated, tapered, curved, narrower in appearance (normal and wide-angle views, by which time the tornado was to our S, moving E). 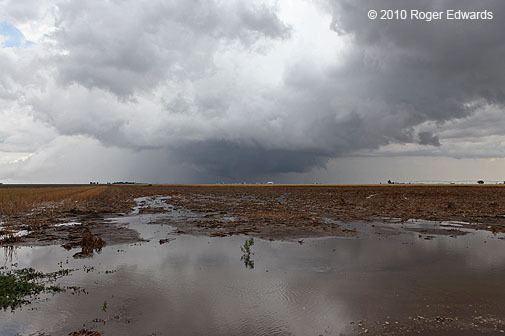 We lost sight of the increasingly ill-defined tornado in wrapping rain to our SSE at 1622, by which time the onset of precip overhead (in the inner-notch region) compelled us to bail E on 412. 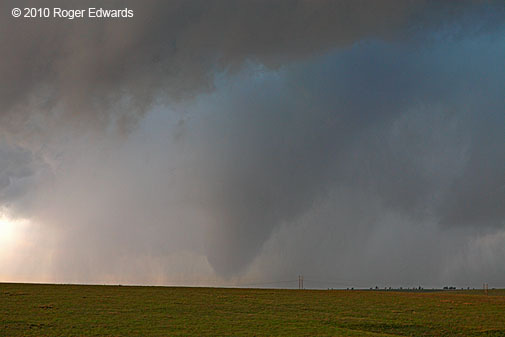 Now look at any of the wide-angle tornado shots and imagine the tornado away. What do you see? Otherwise, it looks like an outflow-dominant, rather junky storm organization with a big gust front and some pretty turquoise coloring on its N side. I’ve seen perhaps hundreds of similar-looking storms with no tornado wrapped in there behind the ragged shelf cloud; but in this case, there it was. 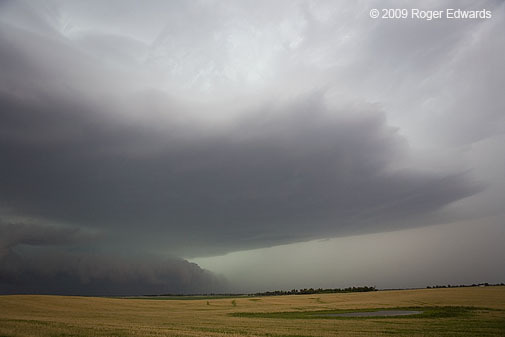 And that’s all the supercell had left in a tornadic sense. From then on, the storm’s successive mesocyclonic occlusions ingested excessive amounts of rain and outflow for tornadogenesis. 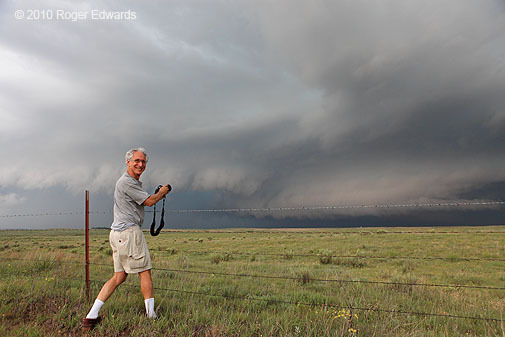 We weren’t sure of this yet, of course; so we zigzagged N and E toward Laverne, meeting Howie along the way (action shot) and nearly getting struck by a staccato CG — the first among a sudden barrage that erupted immediately NE of the mesocyclone(s) in an area heretofore bereft of such a deadly menace. The bolt in question, which was so close I couldn’t tell the direction it hit, gave off an audible “snap” a split second before the simultaneous flash and slicing report of thunder. That momentarily disturbing sequence sent me leaping back into the vehicle glad to be alive and unharmed! I wonder if the snapping noise was the audible effect of a ground-up discharge from some close-by object that preceded the actual return stroke by a fraction of a second. 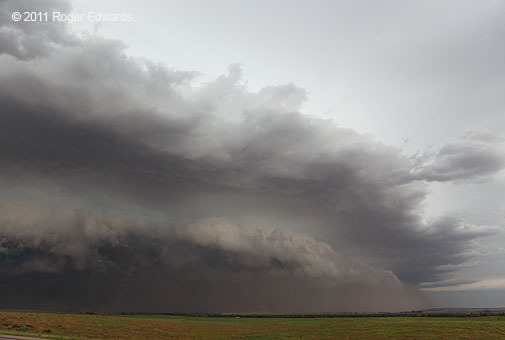 Shortly after Howie left and before encountering the CG, this shot revealed a dark, HP “stormzilla”. Notice the stubby, translucently rain-wrapped funnel at lower left, looking WSW from N of Slapout (heavily-enhanced crop-n-zoom). That highly suspicious protuberance emerged at 1640 CDT from some heavier precip. It also resided beneath a small, obviously rotating tail/collar feature rolling northward along the E face of the storm, toward a broader but weaker mesocirculation in the dark area to its right (N). We cannot be sure whether or not this was a brief tornado. 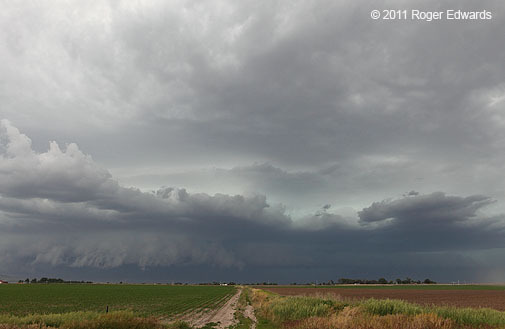 Those were the last shots we took from the storm’s inflow region. It started to gust out, merge with adjoining convection, and evolve a bowing feature as it headed for the area between Laverne and Coldwater KS, hot on our tail. 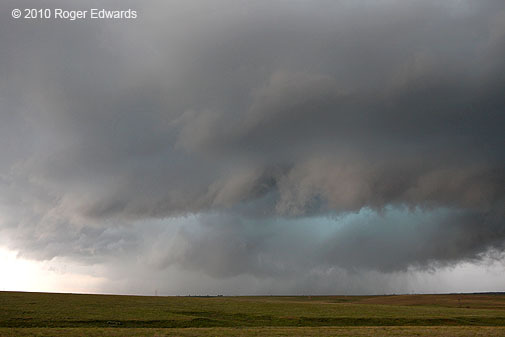 With a central-northern plains target to reach in a couple of days, our minds turned to the potential photo ops on the backside of the complex, so we rushed up to Coldwater and let the northern part of the storm roll over us with likely-severe gusts and a barrage of subsevere hail. After the requisite inland-hurricane experience, we cruised WNW toward DDC for lodging and supper. Along the way, we noticed a peculiar and wonderful combination of visual effects: underneath the MCS’ trailing anvil (not seen in the photo), laminarity along the top of the boundary layer, marked by a hazy delineation, and backdropped by pastel light from and through convective towers. Seldom have I witnessed such a combination, soothing in its beauty. Then things got [i]really strange. As we stopped to watch and shoot that scene, a few miles SE of Ford KS, a distinctive male voice could be heard, slowly rising in volume. Elke asked me what I said; I hadn’t been talking. In a few more seconds, the source became apparent: a car slowly driving southeastbound toward us, on the shoulder of US-400, lights on, following a cyclist. The cyclist, dressed in skin-tight uniform covered with colorful sponsorship logos, rolled on past, followed closely by a car even more festooned in corporate logos. These, however, mostly were unrecognized ads, and the voice booming from the car’s loudspeakers was German! It was hard for Elke (a native German-speaker) to make out what he was saying, however, beneath the pounding beat of Euro-tech dance music also booming from the speakers. It was a rolling DJ, following a European cyclist across the Kansas prairie into the backside of an MCS! 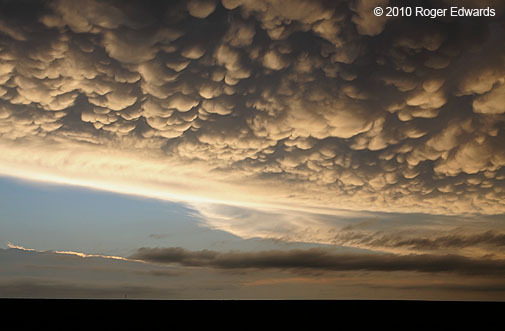 After our own good dinner (a celebratory steak) in DDC, we parked on a hilltop W of town for a short-lived but gorgeous display of mammatus in the sunset light. The clouds glowed somewhere between champagne, iced tea and bronze on the spectrum of hues, and made for a marvelous conclusion to one of the more bizarre but enjoyable storm-intercept days in a long time. 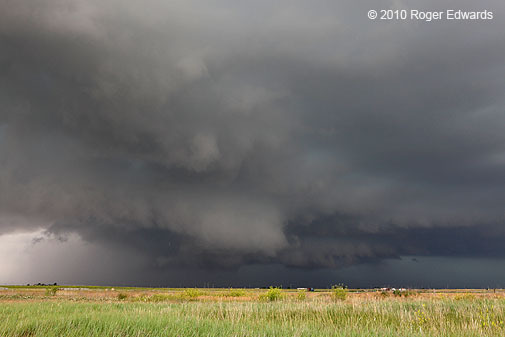 SHORT: Observed skinny supercell from N between Scott-Ness Cities. 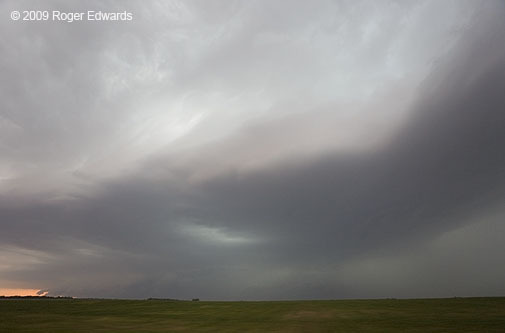 Performed an end-around intercept on HP supercell-turned bow from E of Kinsley to HUT. Munched by bow/HP hybrid in HUT. 3. Storms erupted to our S.
I wanted to hold out longer for the N play, but convective bombs going off were too tempting when compared with the “pancakus” Cu around us and to the N. I’m not sure we would have gone all the way ENE to HSI for that amazing warm frontal storm, but we were in ideal position for the NW KS activity later. A lone supercell formed N of GCK, here shown at wide angle from N of Scott City, then a separate, zoom view of the backside updrafts. In the background, another cluster of convection SW of GCK could be seen; those eventually would hog the inflow and choke off out storm. 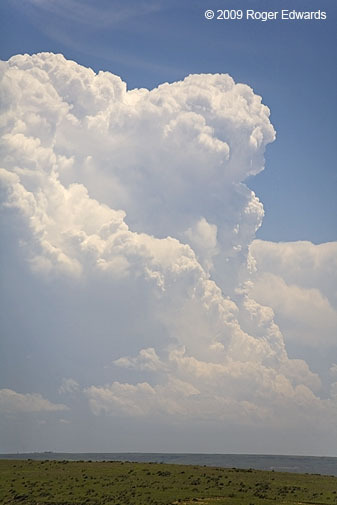 As we drove past its near N side, the updraft looked rather skinny, but was quite intense. Then too many other storms formed in too close a proximity to its SW-SE, and we had to make a choice — go back N toward the NEb border (no deep towers yet visible) or go a long way E then S to get ahead of the lead storm N of DDC. As we headed E past Ness, the lead storm started absorbing cells of assorted sizes to its E and “jumping” mesos eastward, forcing us to go still farther E before dropping S.
We finally did so through Larned, St John and Sylvia, encountering a few hailstones of unknown size in the far forward flank (heard ’em loudly, didn’t see ’em). Heading S toward St. John, I finally got a view of the business end off to the SW — a dark, menacing, HP supercell, absorbing yet another storm (itself with a high but circular/rotating base) into its forward flank. I might have seen the tornado near Macksville as a persistent, gray on darker gray, bulbous form back there in the mesocyclonic murk several minutes later (no photos…very low light, moving). It was about the right distance, direction and time. 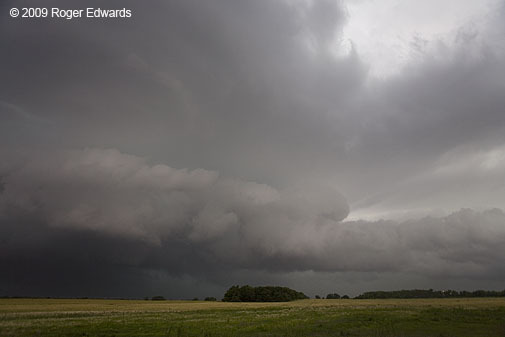 We stopped briefly S of St. John to view the dark menace approaching, then headed E and NE toward HUT to stay ahead (wide-angle photo looking WNW from near Arlington KS). Finally deciding this wasn’t worth going any farther E, we found a protective place and let Stormzilla move over. A sporting goods store on the S edge of HUT was kind enough to let us park under their front porch overhang, right against their doors. It’s not often you get to just stand there well-covered in the lee side of a building, relax, run out now and then to shoot some photos of the oncoming HP/bow Stormzilla, and then let it blast you, no worries. This was one case where having the I-Phone radar provided assurance we wouldn’t be in a truly dangerous part of it (using the DDC radar, since ICT’s 88d timely fried its antenna motor over an hour before). The apex of the bow passed just to our S, the bookend vortex ( old meso from HP phase) just to our NW and N ( here lit by some anthropogenic glow from the W side of HUT), and we sat in an intermediary channel of estimated tropical storm force (~40-50 kt) WNW winds for about 15 minutes. Power went out there and everywhere else we could see during the maelstrom. After the wind-whipping, we headed back toward GBD for lodging. A couple miles S of Sterling KS, the solar orb appeared below the razor’s rear edge of the MCS anvil shield and above the top of the far-away deck representing storms in northwest KS. 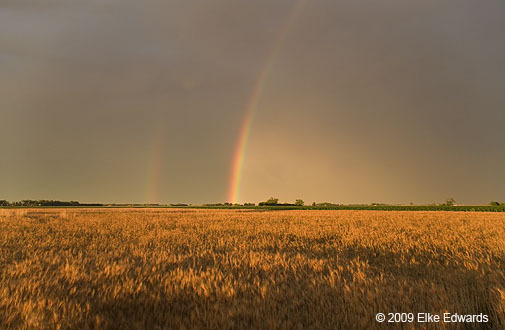 This started up a brief but dazzling double rainbow, its hues warmed across the entire palette thanks to the low sun angle. 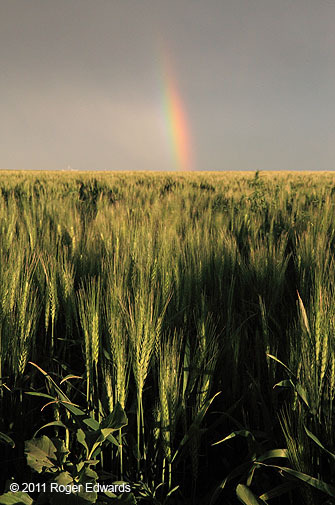 We stopped to appreciate and photograph it across a deeply golden wheat field foreground, with a strip of green corn in the distance. 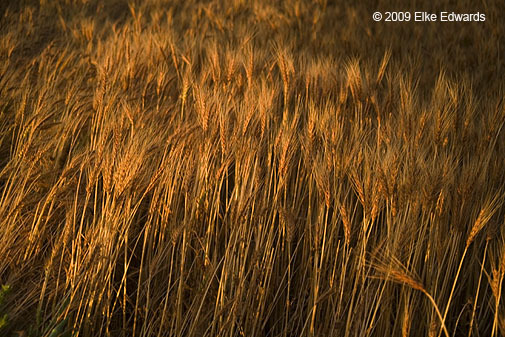 The wheat looked well-nigh ready for harvest. Then came dinner in GBD, where we parked next to yet another among many “look at me” chase vehicles hereabouts in the Plains. This one was festooned with Skywarn stickers, assorted “Storm Chaser” decals, a “J2” decal (as if this was one unit of some sort of team…suuuuuure), and an assortment of anemometers, antennae and PVC tubing atop. Upon closer inspection, only one antenna had any wiring leading inside the vehicle; and the anemometers and tubing were wired up to absolutely nothing. Posers. The large stencils on both sides of the rear windows for a local janitorial service cinched the deal. Yep, we found none other than the Janitor Chasers — keeping you safe and clean! Be advised, if you must travel through GBD anytime soon, the main E-W route is torn all to hell, and down to one abominably rough lane each way, for about 1/2 mile W of downtown. Keep your windows up too, for the long puddles in the adjoining swales of construction mud smell like the bowl of a bus station commode. But our lodging was good, and cheap (<$50 again), and that line of elevated cores provided a thunderous late-night lullaby.